Ind vs WI 1st ODI 2018, the match was an interesting match of the series of 5 ODI matches being played in Barsapara Cricket Stadium Guwahati on 21 Oct 2018. Hi friends, I'm Gyan Ranjan. 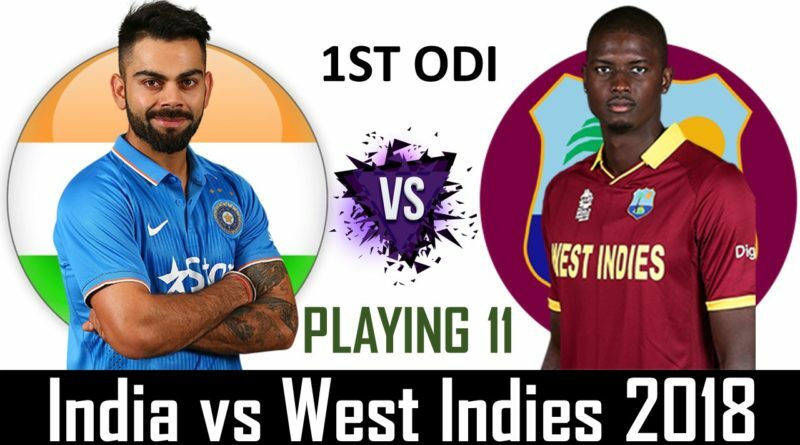 In this blog post, you are about to know Ind vs WI 1st ODI 2018, match preview, live cricket score, interesting match facts, and prediction. You can watch the full highlight of this match. In this West Indies tour of India, India has had won both the test matches. India has had won Ind vs WI 1st test by an inning and 272 runs. In which match Prithvi Shaw proved his talent got a century in a debut match. India won the 2nd test match by 10 wickets and did clean sweep the West Indies in test series by 2-0. In this 2nd test match, Prithvi Shaw played a blasting inning of 70 runs off 53 delivery with 11 4s and 1 6s. But unfortunately, Indian Cricket Team decided to drop Prithvi for ODI series. India is playing with the old team structure. But even in the old structure, India is a strong team. This Indian Cricket Team has the capacity to defeat any team of the World. It seems India has more chance to win, after looking performances of both the teams in previous matches. India 326/2 in 42.1 Overs. India won this match by 8 wickets. Shimron Hetmyer played an amazing inning of 106 runs. He smashed 6 4s and 6 6s in his 106 runs. Kieran Powell also played an inning of 51 runs. Sai Hope 32, Jason Holder 38, Kemar Roach 26, and Rovman Powell and Devendra Bishoo contributed with the 22-22 runs. Yajuvendra Chahal got 3 wickets in this IND vs WI 1st ODI 2018. K Khaleel Ahmed got 1 while Mohammad Shami and Ravindra Jadeja got the 2-2 wickets. Windies scored 322/8 in 50 Overs and gave the target of 323 to win for India. Rohit Sharma and Shikhar Dhawan started the inning for India. Shikhar Dhawan couldn't do a good performance. He lost his wicket after scoring only 4 runs. But Virat Kohli and Rohit Sharma played an amazing inning. They did over 200 runs partnership for the 2nd wicket. Virat Kohli scored 140 runs. He is very close to making 10000 runs in ODI. It was the 36th century of Virat Kohli. Rohit Sharma also played an amazing inning and got another ODI century. He scored 152 runs. He smashed 15 4s and 8 6s in his 152 runs. Virat Kohli smashed 21 4s and 2 6s in his 140 runs. India scored 326/2 in 42.1 overs and won this IND vs WI 1st ODI 2018 by 8 wickets.